A no-brainer if you want the most potent stopping power for personal protection in the .410 2 ½” shell configuration. This is a specialty round that stacks 4 pellets of 00 Buckshot on top of each other to give the equivalent lead energy transfer and the grain weight of several shots of medium caliber projectiles on target. The simple, reliable function of the .410 shell in any number of firearms including now, handguns, makes this a versatile and credible round that utilizes potent load build to stop home threats. Remington has a robust set of offerings in the shotshell market and their experience with defensive ammunition and hunting ammunition makes them an ideal partner for those looking for the time tested and potent solutions to threats. This is a purpose-built ammunition that is made for the ultimate stopping power in .410 shells and have a specific target of threats that need heavy lead delivery. The 1300 feet per second and the 4 00-buck pellets make this an easy choice for those already committed to the cartridge platform. Remington Ammunition has a long history of producing reliable, consistent ammunition that excels in its use case. This .410 shotshell is a great example. A: This product now features 000 buckshot. 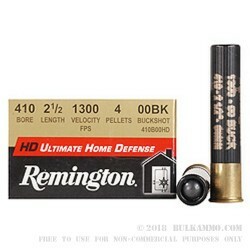 Remington recently changed their 410 Home Defense Load to a 000 buckshot from the previous 00 buckshot. After further testing, Remington determined that this load would deliver better performance with a 000 configuration in the Taurus Judge and other popular defense applications than the previous 00 buckshot.